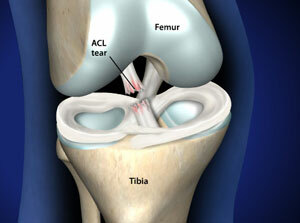 This overuse injury is an inflammation that occurs at the point where the patellar tendon attaches to the tibia. It most commonly affects adolescents. One or both knees may be affected. 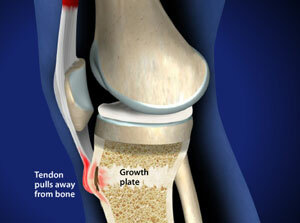 The growth plate is an area of growing bone that is made of cartilage, and so it is an area of weakness in youth. In most cases of Osgood-Schlatter disease, simple measures like rest, over-the-counter medication, and stretching and strengthening exercises will relieve pain and allow a return to daily activities. The bones of children and adolescents possess a special area where the bone is growing called the growth plate. Growth plates are areas of cartilage located near the ends of bones. When a child is fully grown, the growth plates harden into solid bone. Some growth plates serve as attachment sites for tendons, the strong tissues that connect muscles to bones. 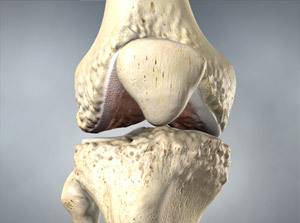 A bony bump called the tibial tubercle covers the growth plate at the end of the tibia. The group of muscles in the front of the thigh (called the quadriceps) attaches to the tibial tubercle. When a child is active, the quadriceps muscles pull on the patellar tendon which in turn, pulls on the tibial tubercle. In some children, this repetitive traction on the tubercle leads to inflammation of the growth plate. The prominence, or bump, of the tibial tubercle may become very pronounced. Treatment for Osgood-Schlatter disease focuses on reducing pain and swelling. This typically requires limiting exercise activity until your child can enjoy activity without discomfort or significant pain afterwards. In some cases, rest from activity is required for several months, followed by a strength conditioning program. However, if your child does not have a large amount of pain or a limp, participation in sports may be safe to continue.